The Hero.Genius. Legend. program with Robin Sharma is designed to help people improve and go way beyond where they are currently at. It can help anyone create a bigger impact on life, relationships, fitness, career, and business. Thousands of people have already enrolled in it and you should, too. The program is focused on creating really powerful habits that last by incorporating 3 key elements together. It will teach you how to think, work, and live so you can emulate the same brilliance as geniuses and great masters. The program comes with a specific structure to help you get the results you want in the fastest and easiest way. It breaks down the quest into a 66-day process. This is the part where you’ll learn how to put your mind in the right mode and how to go around the negative thoughts in your brain. For 7 days, you’ll learn how to feel more grateful even if you’re having a busy day so that you’ll feel magically inspired. For 16 days, you’ll master how to set goals and how to instill new positive habits into your life. You’ll learn how to make your mornings extra amazing and productive. This is the second part of the program where you’ll start thinking and acting like a superhero. You’ll wake up feeling more productive and positive and you’ll learn how to feel that way for the rest of your day. Each time, you’ll keep raising your bar so you can be better at every aspect of your life. This is where you slowly become more effective in setting goals and ignoring constant distractions that are blocking your way to success. This is the most exciting part of the process. For 15 days, the program will condition your mind for success. You’ll know how to be resilient and how to get rid of the temptation to quit even before you realize it. Part 3 is where you start building your empire and being more resilient. It’s when you’ll realize that you actually have everything and that you don’t need anything at all. You’ll learn how to use love as a powerful tool to achieve anything you want- even for your greatest achievements. The fourth part is all about mental mastery. This is where you’ll learn how to master and hardwire the 8 most important mentalities for your dreams. At this point, you’ll start discarding your past so you can have a better and more remarkable future. You can consider the 4th part as the stage where you learn how to move on from superficialities. It’ll bring you a sense of clearer purpose and definiteness so you can readily redirect all of your focus on your dreams. You’ll become a habitual giver as you learn how to cut out inefficiencies out of your life. This is the final part where you’ll finally learn how to be a hero. It will teach you how to fight procrastination and how to be unconditionally brave. You’ll be able to finally remove the barriers that are stopping you from living your dream life and fully utilizing your God-given gifts. Apart from the process, you will also learn the 20-20-20 formula which is also your productivity formula. You will also get to know the 90-90-1 secret successful and high-performance people use to keep themselves successful. The program will also teach you the proper morning mindset that enables world-class action takers to seize their goals. For a lot of people who have tried the product, it didn’t take 66 days to see those results. They were able to experience changes in their lives in early as 7 days by spending only 10 minutes each day on the program. In addition to the actual program, enrolling will also give you access to a really helpful community support composed of like-minded individuals. You’ll also be able to get in touch with its reliable customer support whenever you need help and guidance. By now, you’re probably wondering why you should get it. That’s quite understandable as there are tons of programs that promise the same things. It will help you take massive actions to realize your dreams. By knowing that they are possible, you’ll feel more encouraged to work hard. 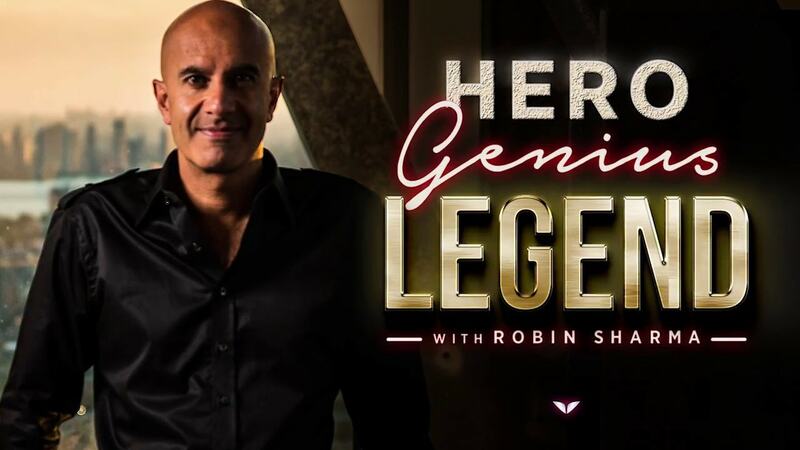 The course will teach you everything Robin Sharma learned from coaching geniuses and titans in different industries. It will give you access to the tools, practices, and mental models that will help you easily achieve a legendary status at work, in your relationships, and in your spirituality. The course is easily accessible. It requires less time in augmenting your learning and creating the right mindset for success. You’ll get feedback from an active community built around the course. This community can also encourage you to work harder. Anyone who knows they have hidden potentials and anyone who wants to have an extraordinary life can get the program. Once you are enrolled, you’ll develop this solid mentality that can help you live an extraordinary life and change the world. And if it doesn’t work, there’s an unconditional 10-day money-back guarantee you can turn to. The Hero.Genius. Legend. program is one of the most effective programs as it’s developed by one of the experts in the industry, Robin Sharma. It’s closely followed by royalty, celebrities, and billionaires. Even rock stars and CEOs patronize it. It’s the result of Sharma’s more than 20 years of hard work with legends around the world. It’s focused on instilling powerful habits that last. The lessons are short which increases retention. It can deliver results as early as 7 to 10 days. There’s just one con to the program and that’s the price. However, considering its discount and benefits, the price is still worth the investment.